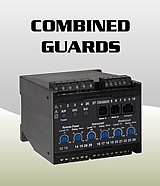 The digital controlled KCW17x range provides precision (1.0%) reverse power and overload protection and monitoring of three phase generators. 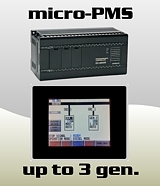 Available for 3-phase 3-wire (2W3) and 4-wire (3W4) systems. 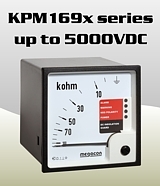 As standard the auxiliary voltage is taken from the unit monitored voltage input. A separate DC auxiliary voltage is optionally available. Meter: Bi-Polar 1Reverse power relay (R3) is used to trip the generator breaker. The overload relay (R1) can be used for non-essential load release or as start signal to standby generator etc. A wide range overload hysteresis can be set to enable R1 to be used for non-essential load to be reconnected or as standby generator stop signal. Relay R2 is intended for notification of a reverse power condition, or can be used for local indication, as input to an alarm system etc. R2 and R3 will latch after trip. KCW176A & KCW176H have analogue output proportional to the generator kW-load. Reverse power relay (R1) is used to trip the generator breaker. The two individual settable overload relays (R2 and R3) can be used for non-essential load release or as start signal to standby generator etc. KCW176F & KCW176HF have analogue output proportional to the generator kW-load. The overload relay (R2) can be used for non-essential load release or as start signal to standby generator etc. A wide range adjustment for overload contact hysteresis can be set to enable R2 to be used for non-essential load to be reconnected or as standby generator stop signal. Reverse overload relay (R1 & R3) is reverse over load protection when generator is running as motor. 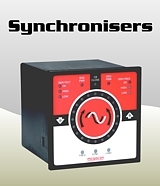 Reverse power relays can be used for generator trip, local indication, alarm system etc. KCW178A have analogue output proportional to the generator kW-load. NB! Meter and relay range is +/-100%. Reverse overload relay (R1 & R3 with different setting range) is reverse over load protection when generator is running as motor. 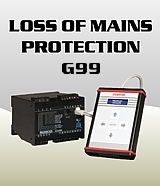 Reverse power relays can be used for generator trip, local indication, alarm system etc. 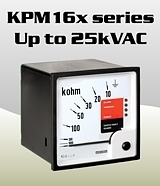 KPW178B have analogue output proportional to the generator kW-load. Reverse power relay (R3) is used to trip the generator breaker. 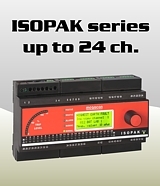 The overload relay (R1) can be used for non-essential load release or as start signal to standby generator etc. A wide range overload hysteresis can be set to enable R1 to be used for non-essential load to be reconnected or as standby generator stop signal. KCW177A & KCW177H have analogue output proportional to the generator kW-load. KCW177F & KCW177HF have analogue output proportional to the generator kW-load. KCW179A have analogue output proportional to the generator kW-load. KCW179B have analogue output proportional to the generator kW-load.